Science and Technology Minister says huge change from 'anti-Israel' Obama Administration to Trump presidency. The presidency of Donald Trump is a "miracle" for Israel, according to Science and Technology Minister Ophir Akunis. Minister Akunis spoke with Arutz Sheva about the speech US Vice President Mike Pence delivered in the Knesset Monday, the raising of the idea of the two-state solution during the speech, and compared the Trump Administration's treatment of Israel to the previous Obama Administration's. "The vice president's speech is the greatest Zionist speech ever delivered by a guest in the Knesset plenum. 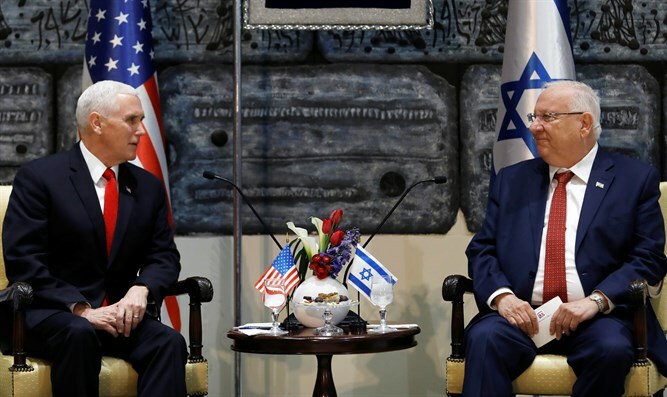 This is a high point in the relations between Israel and the US since 1948, not only because of the moving announcement about the transfer of the embassy from Tel Aviv to Jerusalem, but also because of the [acknowledgement of the] historical ties and connection between the people of Israel and the Land of Israel, which the Vice President did impressively. This can even teach some of the political figures in the State of Israel," Akunis said. Addressing concerns that Vice President Pence's statements stem from a personal religious outlook and are not representative of the position of the US government, Akunis said that "There are always those who downplay achievements, and these are usually those who don't think like Trump and Pence. When Obama was president he and [Former Secretary of State John] Kerry had an anti-Israel policy - and I said so even then, to the displeasure of senior officials here, in light of the suicide bombing plan Kerry presented for withdrawal and the establishment of a Palestinian terror state on the outskirts of Petah Tikva and Kfar Saba. But that was all right with them, and they applauded the most hostile administration to Israel since 1948." "The Trump Administration, on the other hand, is the most sympathetic to Israel. It is a great miracle for the Jewish people," Akunis said. "The previous administration took sides in favor of the Arabs - not only on the Palestinian issue but also in favor of the Iranians. The agreement with Iran is one of the worst in the modern era, and it should also be put in the same category as the surrender agreement signed in Munich on the eve of World War Two. When the free world bows to fascism, whether it be German or Iranian, it loses, and I am therefore glad that [the US is now] taking a stand in our favor. The Science and Technology Minister, however, was disappointed that Vice President Pence mentioned the two-state solution in his address to the Knesset. "Unfortunately, the vice president said that the two-state solution was acceptable if both parties wanted it, and that is an idea I have opposed since my youth." The Minister was asked if he was convinced that John Kerry, the Secretary of State during Obama's second term, had acted out of hatred of Israel. He replied: "In my opinion, yes, the Obama administration was the most hostile to the State of Israel since 1948. Israel-US relations were not strengthened when we were trapped in the pre-1967 lines, but after 1967, when Israel became a significant force from the Golan Heights and southward, through Jerusalem, the Gaza Strip and the Sinai. When the US saw us as its own, it strengthened its relations with us, and China, Japan, Russia, Africa and Latin America all wanted Israel."